Northwest Federal Receives Best Places to Work for Commuters Award! 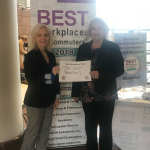 HERNDON, Va.--(BUSINESS WIRE)--Northwest Federal Credit Union was recognized as a Best Place to Work for Commuters at the Fairfax County Board of Supervisors meeting on December 5th. The Best Workplaces for Commuters designation awards employers who have excelled in implementing sustainable and flexible commuter programs such as ridesharing, transit benefits, biking and walking, teleworking, alternate work schedules and other strategies. These types of commuter programs improve mobility by reducing the number of single-occupant vehicles on the road. Best Workplaces for Commuters provides qualified employers with national recognition and an elite designation for offering outstanding commuter benefits.